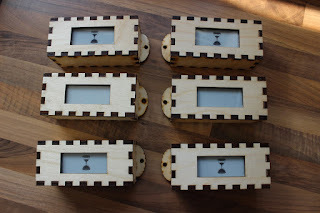 The previousdisplays I made for Vale were pretty straight forward, an arduino nano was connected to a DS3231 real time clock chip and at the appropriate time they displayed a number on an LED matrix display. The whole thing was powered from the mains with a 5V PSU. This year they wanted the same thing, but on the nodes, out in the quarry and this mean battery powered and waterproofed, there had to be some fairly significant changes to the system. I ramble about Vale on the blog quite a lot, it's kind of hard to explain LARP to someone it's much more about being there than talking about it. I've talked about nodes and games and so on but here is the crux of the whole thing. 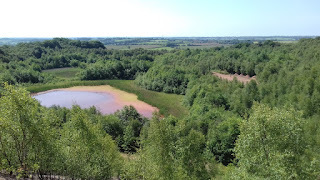 Vale LRP is played in the vast 170 Acre site of Huntely Wood, it's a former quarry so it has woods, lakes and some serious slopes. There are two camps for two different sides of a war, the shortest route between the two camps is 1km, the long path between the camps is 2km and you can extend that exponentially if you go down all the side paths. I quite like to be challenged with commissions and this one certainly did that. I was asked to make a black briefcase to hold potion bottles. It also needed some space underneath it to hold cable ties and cards and other things that might need to be attached to the bottles. The whole briefcase had to be black (although I think the brown edges add to the appearance). A red cobra logo was requested for the lid, the red wood was inlaid through the lid so that the logo showed through the lid and could be seen from both sides. The suitcase could hold 50 potion bottles and the lid closed down tight enough to stop the bottles from rattling around. The handle was built into the racking system for the bottles to ensure that it was strong enough to pick the whole case up. The hinges were laser cut which required me to add some small feet onto the bottom of the case to allow it to stand on end.